5 ounces tubetti or ditalini or other quite small, stout pasta. 5 oz is about one generous cup if you’re using this kind of small pasta and don’t have a scale. 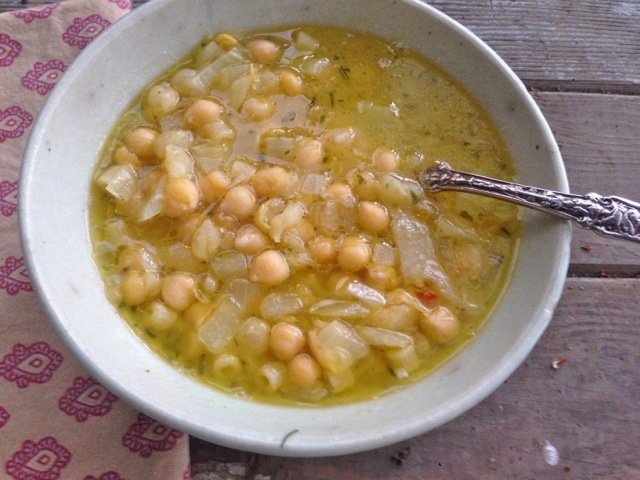 Place a large soup pot over medium-high heat and then pour in just enough olive oil to coat the bottom. Add the onion and celery (and/or carrot if using) and sauté just until tender, about 6 minutes. Add the garlic, rosemary, and red pepper flakes. Sauté for 2 minutes, then add the chickpeas and the bouillon. Bring to a boil, then lower heat to simmer and allow to cook just until the chickpeas are heated through, about 5 minutes. Remove half of the chickpeas with a slotted spoon and set them aside. You can do this next step of pureeing part of the soup or skip it. It’s great either way. Purée the soup in the pan with a handheld immersion blender, or blend in a blender or food processor if you don’t have an immersion blender. Add the reserved whole chickpeas and the pasta to the blended part, season the soup with some pepper (it will likely be salty enough because of the veggie bouillon), and simmer gently until the chickpeas are very tender and the pasta is cooked, about 10 minutes. Add more liquid as necessary. Season to taste with salt and pepper and drizzle with some good olive oil.